SoCal-based neoclassical shredders EXMORTUS are already gearing up to hit the road later this month with modern thrashers , touring September 27 in San Francisco, CA through September 30 in Fullerton, CA. Today, the band is thrilled to announce another group of upcoming dates with metal masters DARKEST HOUR and thrash band WARBRINGER. The dates will begin in Las Vegas, NV on December 1 and hit a total of 10 cities, ending in Upland, CA on December 15. See below for a full listing of all confirmed EXMORTUS tour dates. 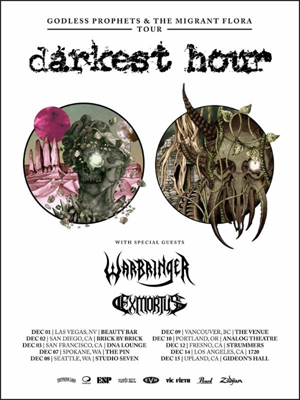 The band says, "We're stoked to hit the road again with DARKEST HOUR and good friends WARBRINGER! Come out and get your craniums crushed and minds melted!" Get a taste of EXMORTUS' high-octane, animated live performances via their music video for the track "For The Horde", featuring behind-the-scenes and live footage recorded from their tour with CHILDREN OF BODOM, ABBATH and ONI. Recorded and directed by James Pesature of Magnetar Studios, the video can be streamed via YouTube HERE. Debuting at #12 on Billboard's Heatseekers Charts, EXMORTUS' most recent full-length album, Ride Forth, was recorded with Zack Ohren (IMMOLATION, SUFFOCATION) and features an "irresistible mix of thrash, death metal and shred", according to MetalSucks. Get your copy now at www.store.prostheticrecords.com/b/exmortus.